Poor data quality: The fourth path to financial ruin? My father was in agriculture for his entire working career. One of his old jokes describes the three paths to financial ruin: Gambling, women and farming. Gambling is the quickest,women are the most fun, but farming is the surest. A high level business case is great for shock value, but it can be difficult to relate to. The infographic lists a variety of sources which can help you to build a detailed business case. For example, The Data Warehousing Institute (TDWI) Data Quality report discusses how poor data quality was a significant contributor to FleetBoston’s failed CRM project – at a cost of nearly $40million. Data quality is critical for CRM and other big IT projects, yet it’s importance is frequently overlooked. Your upcoming system replacement program can be a good starting point for your data quality initiative. 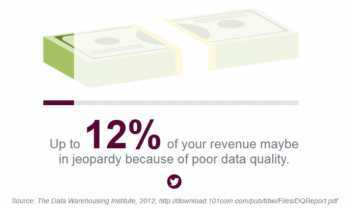 The case for good quality data goes beyond rescuing expensive IT projects.. The PWC Global Data Management survey showed data quality lead to reduced processing costs, better analysis and decision making, and higher sales. BT Group’s data quality journey has also been well documented due to the returns of over $800million that were achieved by improved data management. The team, lead by Nigel Turner, used an iterative approach to continuously improve the value added by the data management team. Many of the benefits achieved weren’t used for the original business case because they weren’t even on the radar. The reality is that very few businesses will be forced into bankruptcy due to poor data quality. But in an increasingly pressured market data quality issues that reduce customer engagement, inhibit the ability to cost effectively comply with the wave of new regulations, or just continue to add unsustainable costs will have an impact on every business. Those that rise to the challenge will enjoy competitive advantage from those that bury their heads in the sand. There are three paths to ruin: Gambling, women and poor data quality. Gambling is the quickest, women are the most fun, poor data quality is the most insidious. ← Will a South African “Nate Silver” emerge after the South African elections?